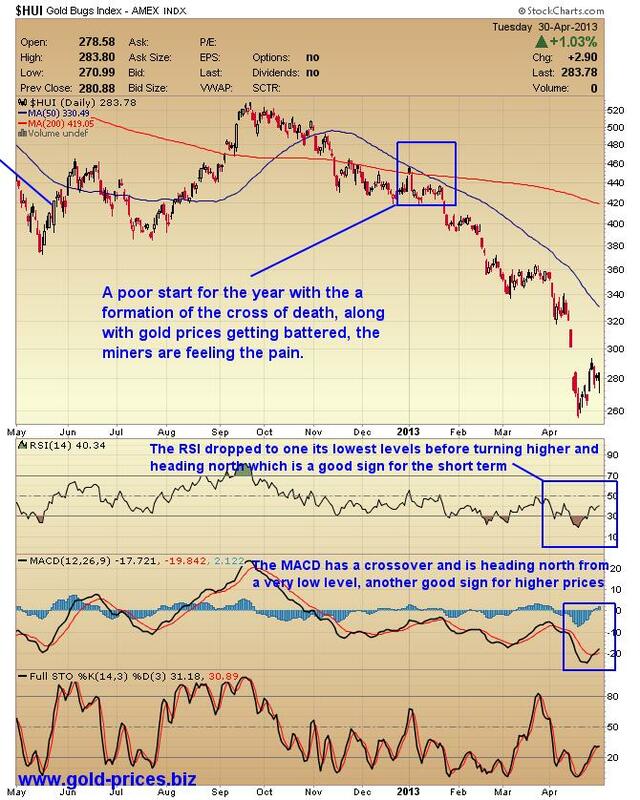 Is This A Dead Cat Bounce For The Gold Miners? In the last seven months or so we have seen the Gold Bugs index, HUI, fall from 520 in October 2012 to 283 today 01 May 2013, registering a loss of 45% in the value of its constituents. The last four weeks has seen the HUI drop 100 points followed by a bounce of 23 points. Many are of the opinion that the bottom is in and are hopeful of a decent rally from this point in order to restore some normality to this tiny sector and repair their investment accounts. The chart below depicts the plight of the gold miners and the severity of the recent carnage that has decimated the stock prices at a time when they need all the friends they can get. Their fortunes are predicated on the gold and silver prices and unfortunately they have been put to the sword in what might be seen as a final capitulation as disgruntled investors throw in the towel and take their hard earned cash to more favourable pastures. The stock market in general would be an obvious candidate as it heads relentlessly higher as the S&P500 flirts with the 1600 level. This week ushers in the FOMC meeting where policy remains pretty much unchanged as they will “increase or reduce the pace of its purchases” as necessary. We also have the latest unemployment report due, should the figures be as expected at around 150,000 new jobs then QE will continue as is, maintaining the status quo. This would do little for gold prices as it is more or less factored into analysts’ expectations. A very poor number might raise the spectre of QE being increased, but we doubt that this will happen. We also have the European Central Bank meeting on Thursday and given that the Eurozone is up against it with rising unemployment causing great difficulties for many of its member states, a rate cut is a strong possibility. Gold prices may get a small boost should this reduction eventuate as the interest earned on the Euro becomes less attractive. Then there is the long dark shadow of a ‘bail-in’ by depositors when the next member state pleads poverty. Investors looking to avoid such events have many alternatives to consider, and the precious metals space is one of them. 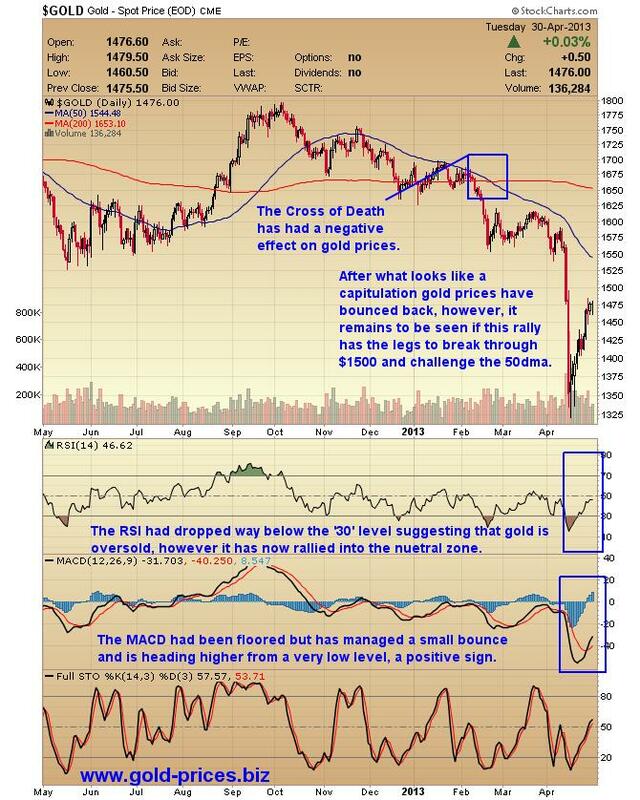 Beyond these two events it is difficult to see just what will be the ignition for gold prices to go higher. The world is already a dangerous place and we are aware of the friction that exists at the pinch points and therefore the geo-political situation is already accounted for in the current price. From what we understand from the dealers there is increasingly strong demand in the physical market with various mints running out of some products, however, the paper market currently determines the price so we do need to keep a watchful eye on the COMEX. Should the COMEX falter and be unable to deliver, then this could be a game changer. However, if they settled the account in cash, then the blow would be softened, after all we are living with the ABN AMRO banks decision to make cash settlements on requests for gold withdrawals. A precedent has been set and others will no doubt adopt a similar stance when investors decide to take physical delivery of their gold. Acquisitions are good for the pipeline but not so good for the bottom line, if the newly acquired production doesn’t come on line in the next year or two. A lot can go wrong in the design/permit/construction phase and it requires an enormous amount of cash to bring a project to fruition. It’s too much to ask an investor to wait three to five years for a potential return on such an investment. Miners have to decide which the highest priority is, the interests of the investor or the expansion of their empire. The US Dollar appears to be rolling over having formed a recent double top and it has also failed in its attempt to form a higher high. The dollar had rallied largely on the fall of other currencies such and the British Pound and the Japanese Yen, however, that rally is now fading. Should the dollar’s decline accelerate then gold prices should improve in dollar terms. The producers are between a rock and a hard place; faced with falling prices and rising production costs. This squeeze on their operational ability makes it difficult for them to pay a reasonably attractive dividend; in fact many do not pay a dividend. So we have a situation whereby some producers pay no dividend and their stock price has tumbled, a recipe for disaster. It is now more important than ever to select the quality producers in this sector, a well-managed mining company, operating in a mining friendly jurisdiction, with low cash costs, generating sufficient revenue so as not to need a loan, etc. On the surface it looks as though the bottom is in and stock prices are cheaper now then they have been for some time. However, that does not mean that they can’t go any lower as disgruntled investors sell into any rally that presents them with an opportunity to exit their positions. The HUI could be the next dead cat on the block so investors must exercise great caution at this juncture as the short term will continue to be volatile as this white knuckle ride gathers pace. With gold and silver stocks being out of favor one must decide if this is a problem or an opportunity. We have steadfastly refused to buy gold and silver mining stocks for the last two years and as evidenced by the HUI we feel that our decision to hold back has been vindicated. The damage done to the mining sector may not be over yet but this demise is starting to offer up some exciting opportunities in my view.